Barkworthies grade-A, naturally shed elk antlers have a smaller profile appealing to more dogs and a lower price point appealing to more owners. 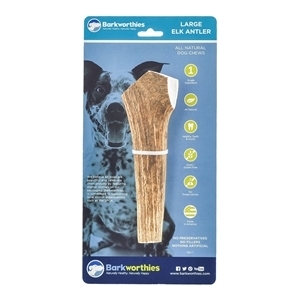 Barkworthies Elk Antlers are dense, durable dog chews that will give your dog hours of chew time, beneficial vitamins and minerals as well as cleaner teeth! Our American-sourced, naturally-shed elk antlers come from the Rocky Mountains. After they're collected, they're simply washed, cut and packaged. We also round any sharp edges to make them extra safe for your dog.